A child’s upbringing in today’s world differs greatly from the past – it often seems like the days of muddy jeans, playgrounds, and face-to-face social interaction are gone. We are now calling for debates on subjects such as “screen-time” for electronics, e-books and interactive online games. Questions arise regarding the benefits and consequences of having infants and toddlers learn mainly from electronics, and how children of all ages are impacted by what seems to be a constant stream of information, images, and social media demands. It is important to look at the effect that overuse of technology can have on children’s cognitive development – their ability to adjust to new and known stimuli, their ability to process information and recall it when needed. Some view technology as a battle against cognitive growth as children become “tech-savvy” and yet remain unable to self-regulate their attention span and impulses. One thing is clear. Children are consistently inundated with information via technology that they must process and comprehend on a daily basis. Today’s world has a wealth of knowledge that can be accessed at one’s fingertips, but some of that information can be harmful to the development and overall well-being of children. The harm can be done to both their physical interaction with the world as well as their critical thinking processes. 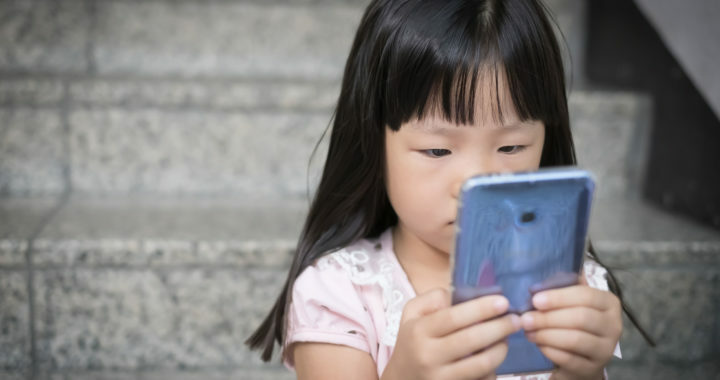 The constant distraction provided by screens can cause a stark disconnect in a child’s natural sensory and cognitive development. Electronics can inhibit a child’s sensory experiences with the external world and limit them to a digital one. This impacts how they learn and maintain needed skills, for example, memory recollection, particularly as so many answers to questions can quickly be found by simply asking Siri. Without sensory development through movement, touch, and direct interaction with others, a child’s capacity to develop essential sensory processes can be inhibited. Consider traditional kindergarten classrooms with sensory tables that allow children to work with sand, water, felt, or any other safe, textured material to begin learning basic concepts of how they can affect their surroundings just with their hands. Toys like building blocks with letters and numbers give them representation of the symbols that they will eventually use to write and create. By relying on electronic devices, without a balance of more traditional learning techniques, children may struggle to understand core concepts like time and the consequences of their actions, and not fully develop their capacity for creativity and proper self-regulation. In addition to considering the amount of time children spend on screens, content remains an important issue to consider. Without effective screening, parents and guardians may unknowingly allow their children to view disturbing content, even while simply trying to keep them entertained on long car trips or in waiting rooms. There has long been attention given to violence and sexual content that youth may be exposed to on screens of all types. There are organizations such as the ESRB (Entertainment Software Rating Board) and Common Sense Media that assign ratings for video games, apps, websites, movies, and more to assist parents in making informed choices. This type of information can help parents make decisions on what best fits their child’s stage of development. We all can recognize the benefits of our technological advances; however, we need to remain vigilant about the negative consequences as well. There are many questions about our reliance on the digital world that will take time to answer. And clearly, technology itself is not to blame, but now is the time to consider the way we use it. How it is integrated into our children’s lives may have lasting effects on their growth and development. Awareness and a close monitoring of time, content, and interaction are key to keeping a balance in your child’s life. Stephanie Gomme is a Parent Partner in the Family Empowerment Program at CoveCare Center.